Lebanon – Understanding what behaviors are respected and expected in social and business situations is important no matter where you live. With diversity and cross-cultural issues common and complex in both daily life and business, there is an increasing demand for civility and social skills training. Internationally recognized as leaders in the field, Civility Experts Worldwide, under direction of Lew Bayer, President & CEO, are pleased to announce the expansion of their training division with the opening of licensed affiliate Train the Trainer office in Lebanon. Mr. Asmar believes that naturally, Civility is in our body, we just have to show it. That’s why his trainings & coaching are stamped with customized program design based on the body preparation on How to show your skills & improve your personal identity through any kind of relationship with a touch of acting coaching based on motivational approach and sports spirit. 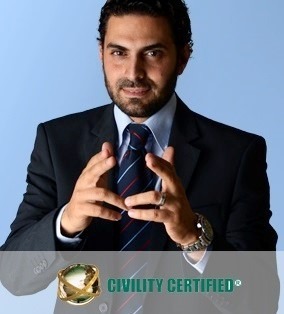 Through La Maison de L’etiquette, Marwan Asmar will be accepting applications from business professionals, consultants, coaches, teachers and others who wish to achieve certification as Civility at Work® Trainers and Courtesy Coaches®. These programs, created by Civility Experts Worldwide are the only internationally civility certification programs acknowledged by the International Civility Trainers’ Consortium. (ICTC).